We’re into the final days before members of the European Parliament vote on the Copyright and the Digital Single Market Directive, home of the censoring Article 13, and the anti-news Article 11. Europeans are still urging their MEPs to vote down these articles (if you haven’t already, call now, and stepping up the visibility of their complaints in this final week. The first salvo drawing attention to the damage the directive will cause has come from the European Wikipedias. German Wikipedia has gone completely dark for today, along with the Czech, Slovak and Danish Wikipedias, German OpenStreetMap, and many more. With confusing rhetoric, the Directive’s advocates have always claimed that they mean no harm to popular, user-driven sites like Wikipedia and OpenStreetMap. They’ve said that the law is aimed only at big American tech giants, even as drafters have scrambled to address the criticism that it affects all of the Internet. Late in the process, the drafters tried to carve out exceptions for “online encyclopedias,” and the German government and European Parliamentarians fought hard – though ultimately failed – to put in effective exceptions for European start-ups and other competitors. Very few of the organizations and communities for whom these exceptions are meant to protect are happy with the end result. The Wikimedia Foundation, which worked valiantly to improve the Directive over its history, came out last week and declared that it could not support its final version. Even though copyright reform is badly needed online, and Wikipedians fought hard to include positive fixes in the rest of the Directive, Article 13 and Article 11 have effectively undermined all of those positive results. Despite some good intentions, the wholly problematic inclusion of Articles 11 and 13 mean that fundamental principles of knowledge sharing are overturned: in practice users and projects will have to prove they are allowed to share knowledge before a platform permits an upload. 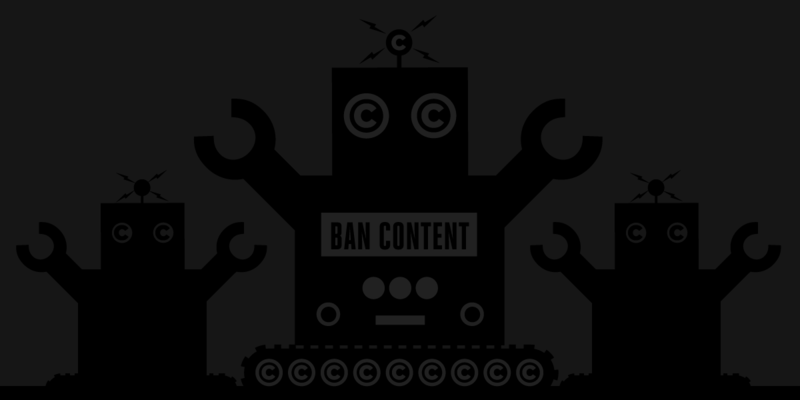 The EU Copyright Directive envisions a technical and legal infrastructure that treats user generated content with suspicion unless proved legal. We cannot support this—it is better to have no reform at all, than to have one including these toxic provisions. The European lawmakers who see Article 13 and Article 11 as a simple fix for the woes of entertainment and news media companies still don’t get that the Internet isn’t a competing “industry” – it’s an ecosystem. Companies like Google and Facebook are certainly supported by that ecosystem – but so too are the billions of individuals, thousands of European companies, families, and ad-hoc communities of creators, coders, and services. As Wikimedia says, this Directive turns the simplest basic actions of those Internet users - sharing and linking - suspect. Websites must check everything that users upload, because if they upload something that another person decided is their own, the website can be liable for unbounded costs. If Article 11 passes, everyone will have to make a legal assessment when linking to the news, out of fear the text accompanying their link contains one too many words, and triggers Article 11’s licensing requirements. The sites that are shutting down today in protest are, without question, sites that are home to European creators: the very people that Article 13 and 11 adherents claim to be protecting. That these parts of the European creative community are so concerned about their own future, and the wider ecology of the Net, should be a giant, flashing, warning sign to all MEPs. If you’re in Europe, contact your MEP, and join the protests this weekend. The future doesn’t have to be as dark as it looks today.